We're not the types to "play it cool", we were goddamn ecstatic. From the second we loaded in, everything just felt right. The staff at First Ave could not have been nicer or more polite. We were treated good, which I think is a big reason any band you talk to loves playing at the Entry (or the Mainroom). We played what we felt was our strongest set yet. Malaparte is a St. Paul based, indie-rock band that will make their first appearance at the 7th St Entry tonight. Stacy K's debut full length album, Swarming with Frenzy, Swirling with Delight, is experimental in sound; intertwining acoustic instruments and electronic elements. Stacy was featured on 89.3 The Current Blog's brand new acts to keep an eye on - “Breathy, gauzy, moody pop” as well as the Vita.MN Are You Local 2013: Best Tracks. Tuesday night will feature a plethora of midwest artists who sum themselves up as Official Dopeness. 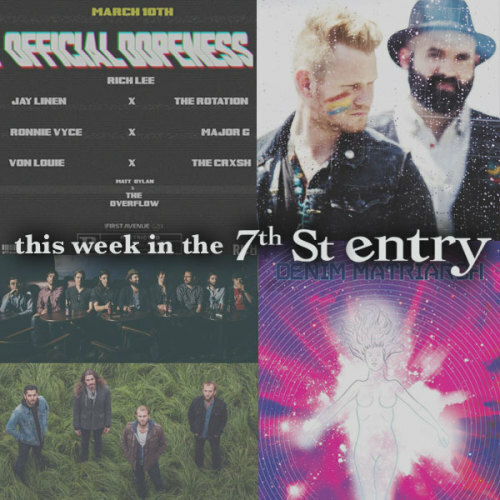 Rich Lee, The Crxsh, Matt Dylan and the Overflow, The Rotation, Ronnie Vyce, Jay Linen& Von Louie, and Major G will all be taking over the 7th St Entry. This mix of rap, hip/hop, and rock & roll artists will combine to make the night "officially dope." Rapper Ronnie Vyce spits fascinating lyrics of an Electric Hip Hop sound, that tends to engross the mind. His verses are not what you would call aloof, rather referred to as particular. Major G has appeared alongside artists such as Snoop Lion, Mac Miller at Soundset music Festival 2013 and Cam-ron at First Avenue just to name a few. Matt Dylan and the Overflow are certainly the most diverse in style for the night as they restlessly refuse the concept of genre respective limits. Bringing forth songs with strong elements of Rock, Folk, Funk fusion, and even some country. Harbor and Home started as a small group of individuals who grew up attending church and school together. As of spring 2013, they are a band dedicated to the sole purpose of being a light in the darkest times of life. Being the hope and the inspiration that gets us through the most difficult of times. The name, "Harbor and Home" comes from places of refuge and security. Places you can trust and things that you call dear. They believe that their music can be this for anyone who is searching for it. Misch is a Minneapolis-based indie-pop, alternative-folk artist with a winning personality and compelling music to share. Her music recollects moments and memories we can all relate to while her passion exudes from every mystifying melody. Also performing that night will be Austin Plaine, an artist inspired by Bob Dylan, Bright Eyes, Elliott Smith, and Ryan Adams. It's easy to see why he has found a love for songwriting and lyrics. The Minneapolis-based singer/songwriter turned to music as his personal outlet and hasn't looked back since. Since Women's dissolution, the members of the Calgary band have gone on to form various projects, and this includes Viet Cong. Formed in 2012, the group features Matt Flegel and Mike Wallace from Women, along with Daniel Christiansen from Sharp Ends and Scott Munro from Lab Coast/Reuben And The Dark. Following a scattering of live shows, Viet Cong‘s highly anticipated, self-titled debut album is receiving critical acclaim across the board for it's depth, power, and sheer inventiveness. It takes less than sixty seconds of album opener “Newspaper Spoons” for you to decide that Viet Cong is a winter record. The album has barely begun, and the guitar doesn't snarl until the end of that opening minute, but it still presents a palpable iciness in just a few short moments. It's bitter. It stings. But once you're in it, and you're bracing yourself and charging ahead, “Newspaper Spoons” moves from a punishing, almost militarized drumbeat to a melody that's still menacing but also delicate, almost celestial. Special guests of the night will include Andy Shauf and Hollow Boys. Sam Cassidy is a genuine, everyday guy with a unique brand of blue-collar rock that is irresistibly likeable. He's endearing and introspective and his debut full length, Debt, is littered with golden melodies that hit the spot. The buzzy rocker is slightly twangy, mostly Americana, and certainly charming. His pull-yourself-up-by-your-bootstraps everyman's music is supported by a “sprawling” live band and also earned him a slot as one of First Avenue's Best New Bands of 2014. The Bros. Landreth consists of four bandmates, two brothers, and one album. Let It Lie, is the debut release from these Canadian roots-rockers. Anchored by the bluesy wail of electric guitars, the swell of B3 organ, and the harmonized swoon of two voices that were born to mesh. At first listen, you might call it Americana. Dig deeper, though, and you'll hear the nuances that separate The Bros. Landreth — whose members didn't grow up in the American south, but rather the isolated prairie city of Winnipeg, Manitoba — from their folksy friends in the Lower 48. Album highlights like "Our Love," "Firecracker" and Nothing" were all inspired by a string of rocky relationships, but Let It Lie is more than a breakup album. Filled with mid-tempo rockers, butter-smooth ballads and cowboy lullabies, it's the sort of album that finds inspiration not only in the landscape of the human heart, but also the windswept prairies that stretch for hours on every side of Winnipeg's city limits. The music is steeped in the history and heritage of the band's hometown, and if it sounds wintry at times, that doesn't mean it's not downright lovely. Opening the night will be Gabe Barnett. Gabe is an artist who could be compared to folk icons like Woody Guthrie and Bob Dylan, but to do so would imply something less than genuine about this fiercely independent, grassroots folk singer. He embodies the spirit of the wandering troubadour, to be sure, but there are no gimmicks or mimicry to his music. The band formed in 2009, when Agin crossed paths with guitarist William T. Cook in Nashville. Surrounded by the rootsy twang of country singers and Americana bands, the two began whipping up a different sound, one that relied heavily on mood, melody and motion pictures. They didn't just write songs. They created complex backstories for each tune, digging deep into their collective imagination and conjuring up fictional characters, plot lines and landscapes. Those backstories helped inspire the band's symbolic clothing and stage setup, too, transforming Neulore's concerts from routine gigs into actual experiences. Animal Evolve, Neulore's Chop Shop/Island Records debut, is the soundtrack for an epic action movie that doesn't exist. “Cinema has always affected the way we think,” says Adam Agin, one half of the modern folk duo. “We have songs that sound like battlefield scenes. We have songs that sound like you're running wild in an open field. We're huge fans of movies, so it's natural for us to dream up some sort of visual scene... and then figure out how that scene would sound.” Anchored by tribal drums and electric guitars, Neulore's songs are better suited for the arena than the campfire. The music swells and swoons, with tense verses that break into epic, open-armed choruses. It's a sound that tells a story, much like classic folk music... but it does so with gang vocals, synthesizers and the anthemic sweep of rock & roll. Special Guest, Benjamin Cartel will open up the night at the 7th St Entry. Denim Matriarch is a progressive rock group from the slums of Minneapolis. Comprised of friends Nathan Levin, Jon Lindquist, and Sam Ruff, Denim Matriarch has been making music since 2011 and draws from many different styles and influences. The cauldron of ideas each member brings to the table creates a unique sound, with blended aspects of blues, experimental, and psychedelic hard rock. The "Inconceivable Master Plan" is a 100% pure improv trio that was formed in the last weeks of 2008. Since then, IMP has opened as direct support to : EOTO, Ozric tentacles, Vibesquad, Desert Dwellers, Eliot Lipp, The Widdler, The Bassist & many more. Aaron Bjerke (Loom In Essence) joined as the 4th member in December 2013. They have also had sets featuring guest artists such as: Willie Waldman on Trumpet and Seedless & Trevor on Digeridoo's. After nearly a decade making music together, multi-instrumentalist Sam Rivkin and drummer Eric VanderVorste formed Meinong's Jungle with guitarist Nicholas Voltaggio in January of 2014. Taking influence from genres as diverse as IDM, glitch, funk, dubstep, jazz, and hip-hop, Meinong's Jungle fuses digital and organic elements to create unique sets of 100% improvised live music each night.